Many actors promoting irrigation technologies in low- and middle-income countries want to ensure that men, women, and different social groups have equal opportunity to participate in and benefit from irrigation but are uncertain how to do so. 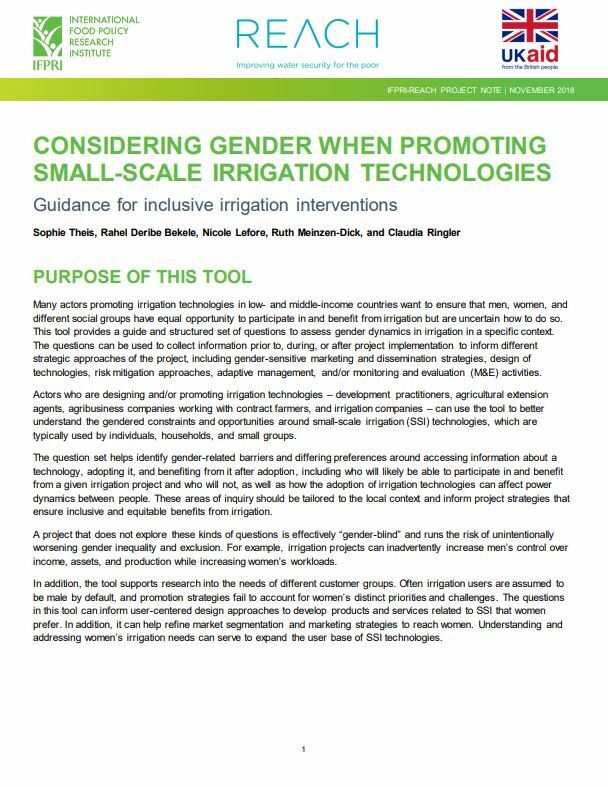 This tool provides a guide and structured set of questions to assess gender dynamics in irrigation in a specific context. The questions can be used to collect information prior to, during, or after project implementation to inform different strategic approaches of the project, including gender-sensitive marketing and dissemination strategies, design of technologies, risk mitigation approaches, adaptive management, and/or monitoring and evaluation (M&E) activities.